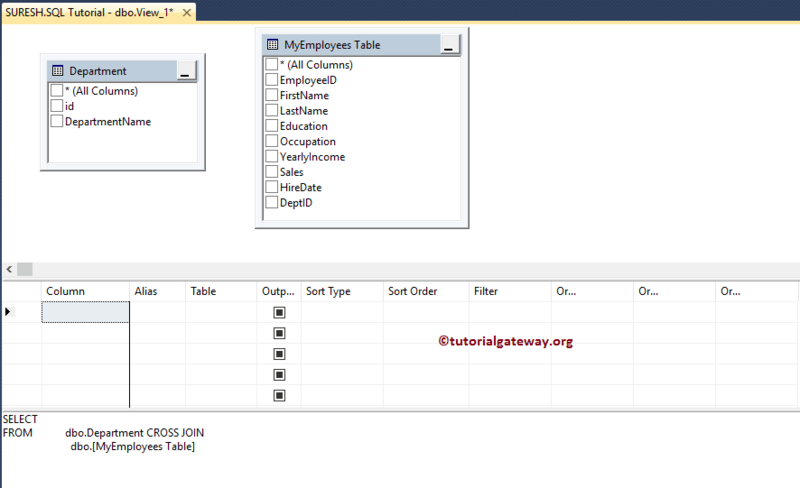 The SQL Views are the virtual tables, which consists of a columns, rows from the referenced table. 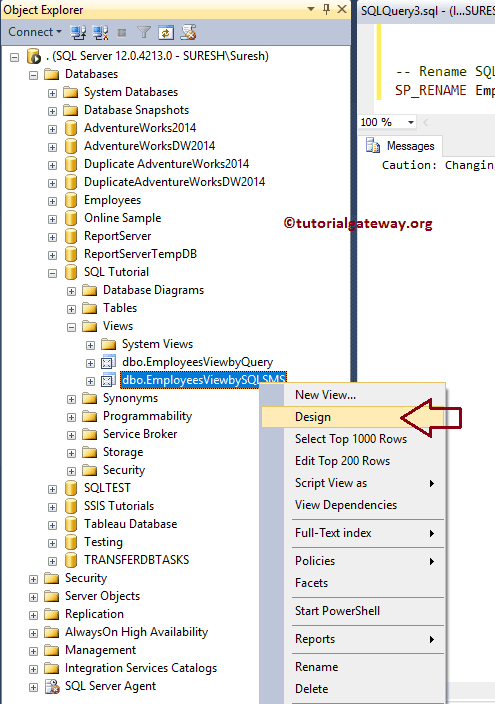 Unless, we defined indexed views, a view does not store a set of values in a database. When you use the SELECT Statement against a view, then the records will come from the table that we referenced while creating a view. 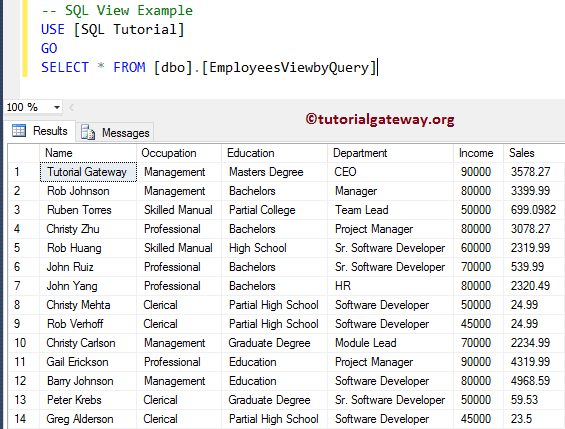 In this article we will explain you, How to create View in SQL, modify, rename, and delete Views in SQL Server. To simplify the data as per the user needs. Restricting the Users not to access the entire database. NOTE: Some clients give access to Views only, and they will not allow you to access their main database. 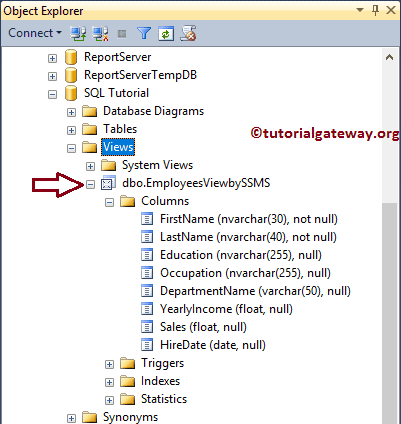 In order to view the existing Sql Server Views, Please select the Database that has the views. From the below screenshot you can observe that, our [SQL Tutorial] database has no views. Right click on the Views folder will open the context menu. Please select the New View.. option from the context menu as shown below. 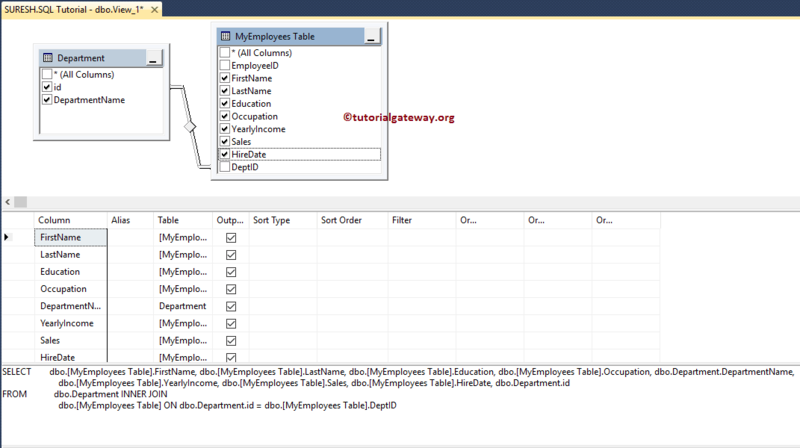 Once you click on the New View… option it will open the Query Designer in separate window, and a Pop up window to add the required tables. Here, you can add functions, tables, or views. From the below screenshot you can observe that, we selected the MyEmployees table, and Department table. 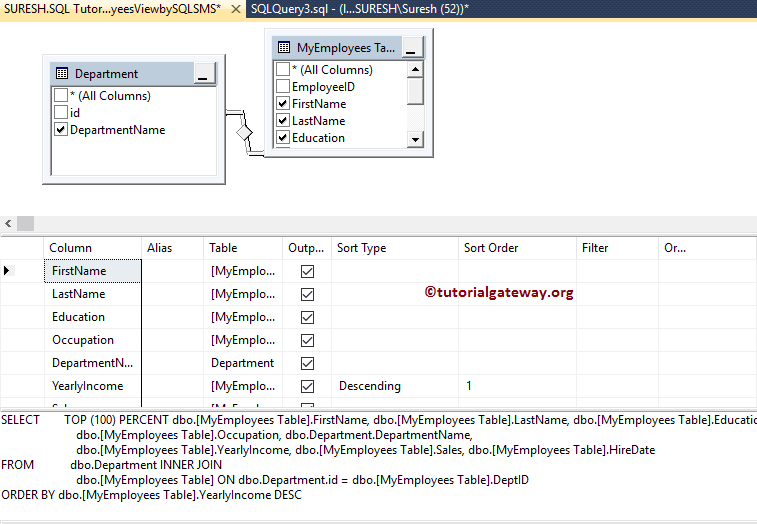 Once you selected the required tables it will show the Query Designer. Please select the required columns by check marking the column names in the Diagram Pane. In this example we selected the First Name, Last Name, Education, Occupation, Department, Yearly Income, Sales, Hire Date from two tables. Remember, you can Join two tables by dragging one column on to the other. 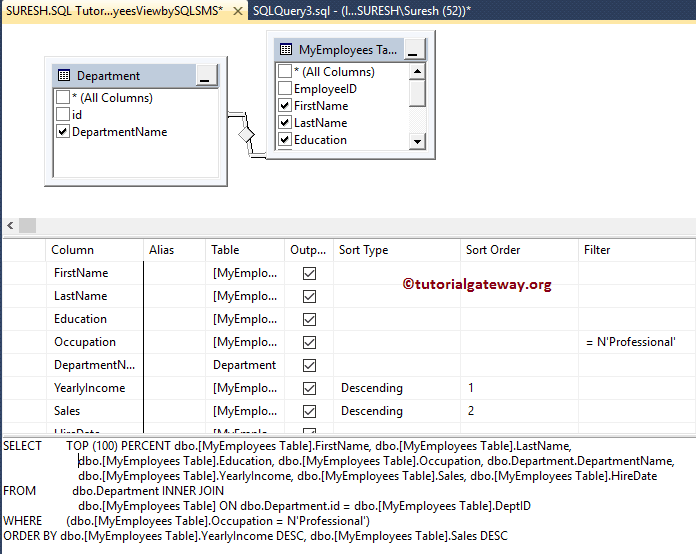 Sort Type property is used to apply SQL ORDER BY functionality. Within the Grid Pane, Please change the Sort Type to Ascending or Descending as per you requirement. 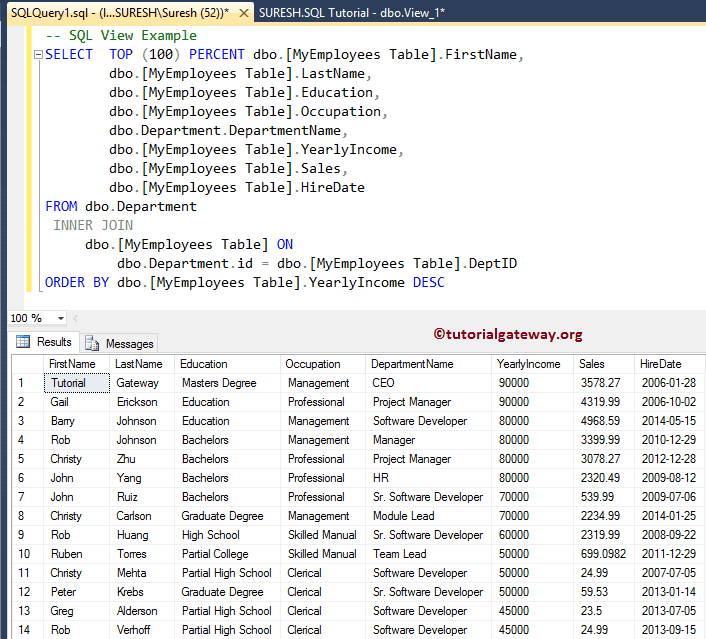 In this Sql Server views example we are sorting Yearly Income in the Descending Order. Next, go to File Menu and select the Save option to save the designed View. That will open the pop up window called Choose Name to change the default name. The following screenshot will show you the View that we created, and expand it to see the Column names. 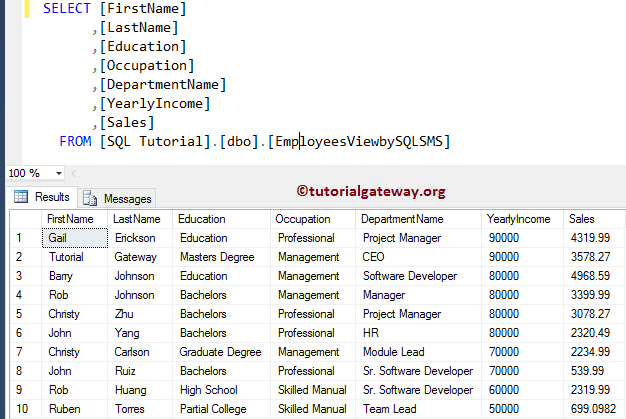 The SQL Server allows you to use the built-in stored procedure sp_rename, or the management studio to rename views in SQL Server. 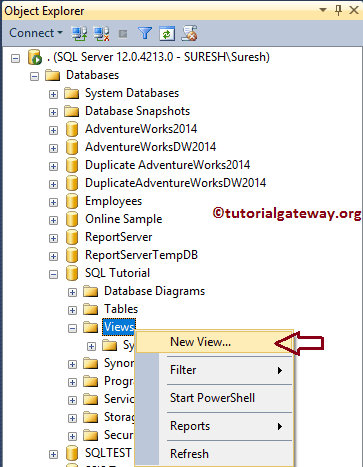 In this example we will show you, How to rename the SQL View using SSMS. Once you click on the Rename option, SSMS allows us to rename as per our requirements. 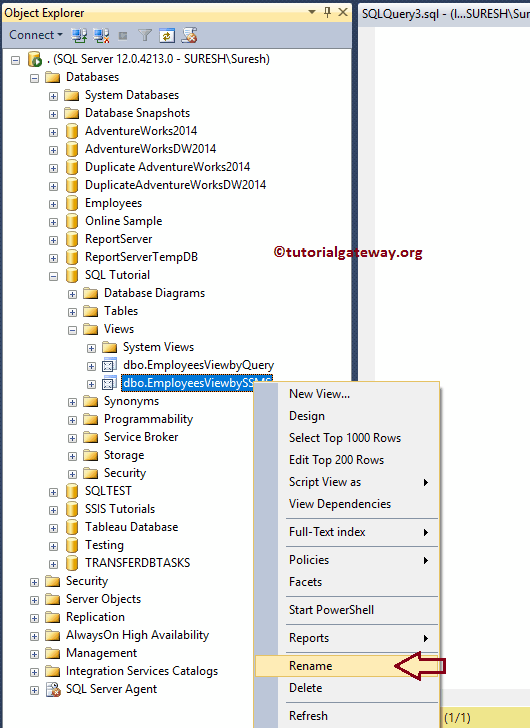 In this example we will show you, How to rename the existing view using sp_rename stored procedure. To do so, Click New query and return the following query. Dependency Objects such as triggers, or stored procedures will not be effected by modifying a view. You can use the ALTER VIEW statement on indexed views because, ALTER VIEW will unconditionally drops all the indexes on the views. 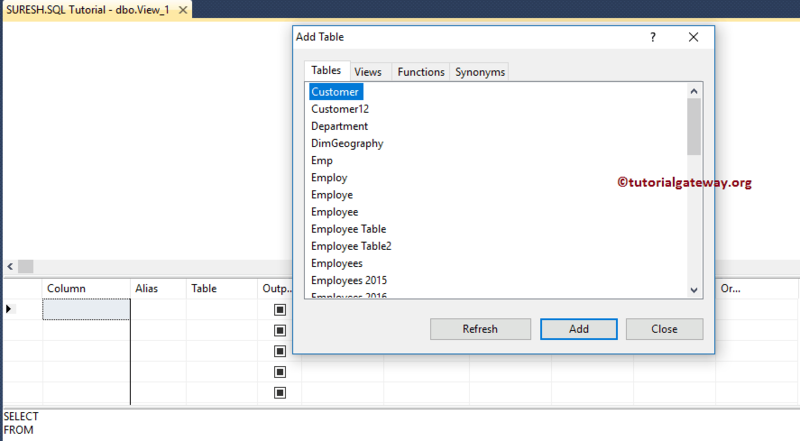 Once you select the design option, a new design query window will be opened with existing tables, along with the relationship. You can modify as per your requirement. 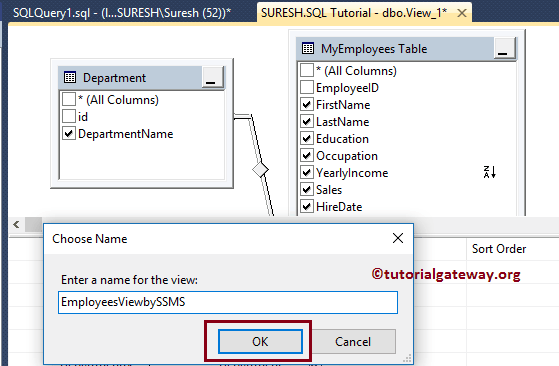 Let me select all the records from the EmployeeViewbySQLSMS to show the modified records. 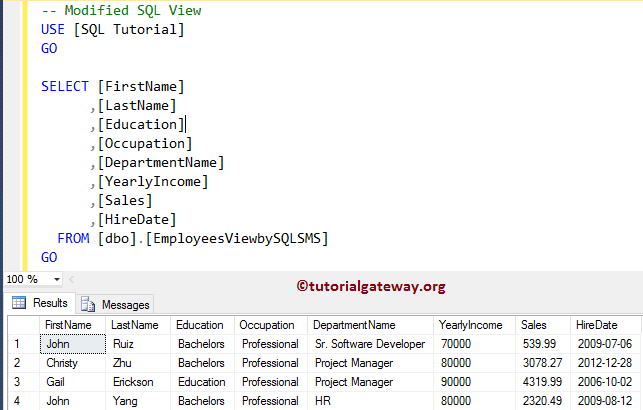 In this SQL View example, we will show you the steps involved in modifying the existing view using ALTER VIEW statement. To do so, Click New query and return the following query. 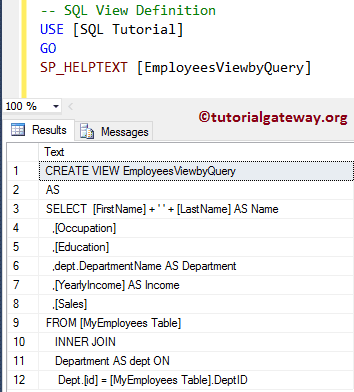 In this example we will show you, how to use the sp_helptext stored procedure to get the definition of any view in SQL server. 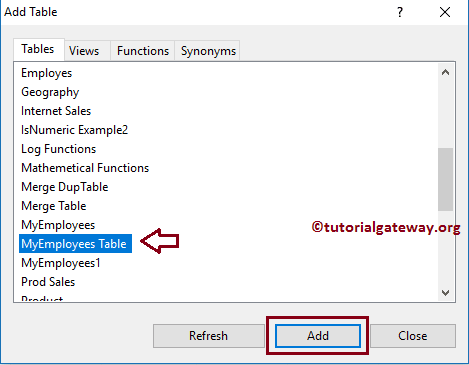 Deleting, or Dropping a Table will not drop the dependent View. 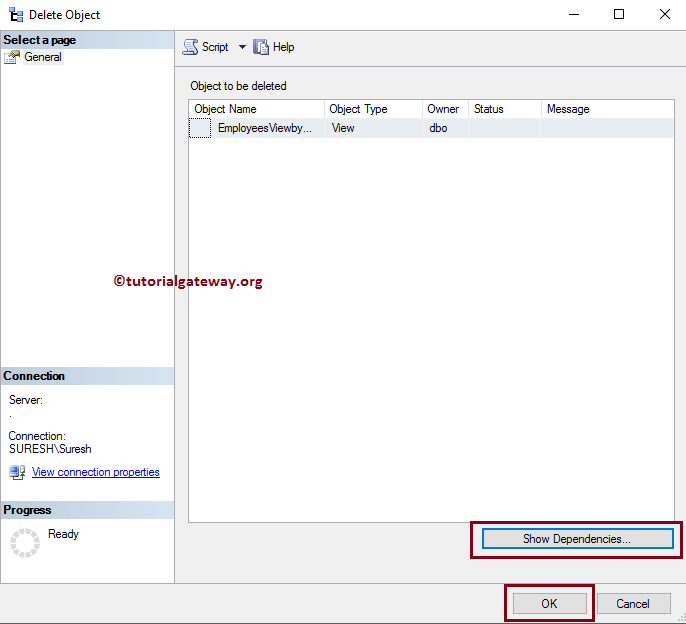 You have to explicitly use the DROP VIEW statement to delete Sql Server view. 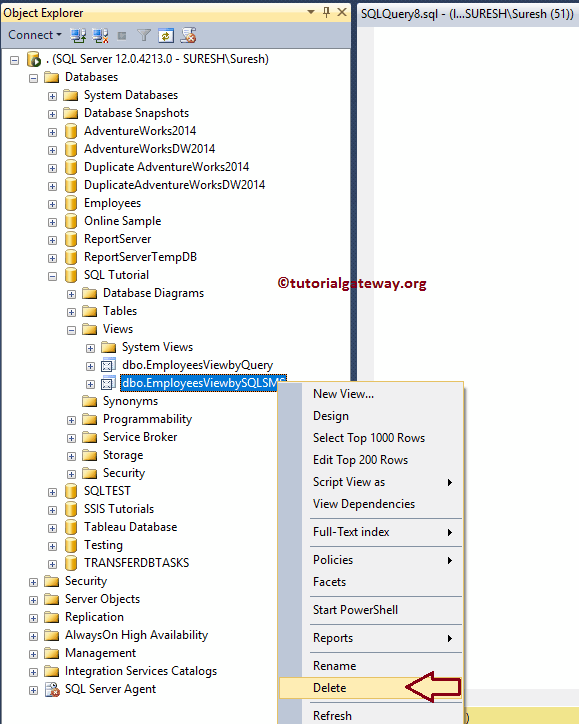 When you drop a view, all the view information (including the definition) will be deleted from the system catalog. 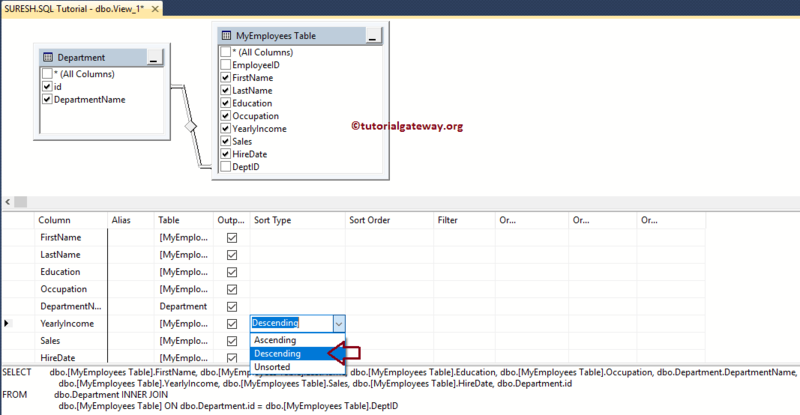 Once you select the delete option, a Delete Object window will be opened as shown below. Click on the show Dependencies button to check the dependencies, and then click OK to delete the view. 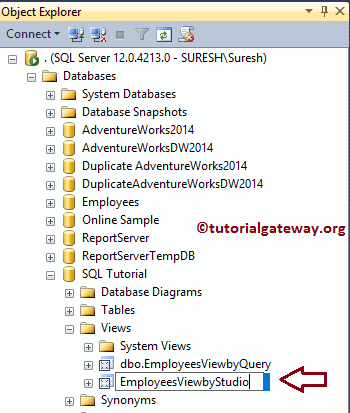 In this example we will show you, How to delete a SQL View using the T-SQL query.